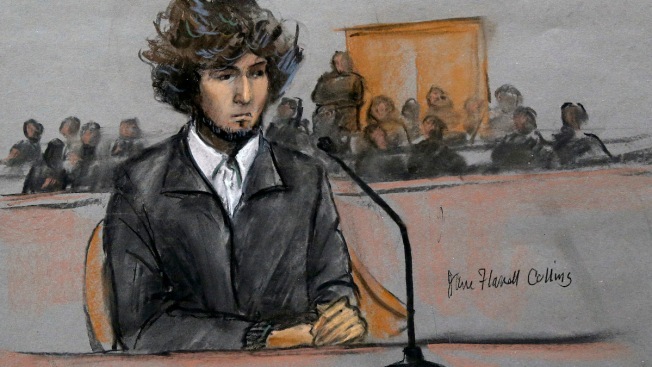 In this courtroom sketch, Boston Marathon bombing suspect Dzhokhar Tsarnaev is depicted sitting in federal court in Boston Thursday, Dec. 18, 2014. A federal judge has rejected a third request from lawyers for Boston Marathon bombing suspect Dzhokhar Tsarnaev to move his trial outside Massachusetts. Judge George O'Toole Jr. said Friday that the process of questioning prospective jurors has successfully identified people who are capable of being fair and impartial. A defense motion is still pending before a federal appeals court, which seeks an order directing the judge to move the trial. O'Toole says he has made progress toward the goal of finding 70 potential jurors. Prosecutors and the defense team will then be allowed to eliminate 23 people each for strategic reasons. The defense has argued that Tsarnaev cannot get a fair trial in Massachusetts because many here were personally affected by the bombings and already believe he's guilty. Three people were killed and more than 260 were wounded in the 2013 attack near the finish line.